Diving at Manta Point in Nusa Penida, Bali should mean a glorious encounter with graceful manta rays. 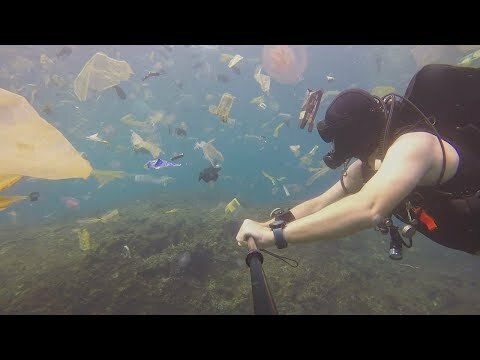 Instead, as this diver filmed, it meant swimming in a sea of plastic pollution. Jump in the water with some great whites and come away with a whole new appreciation for their beauty, grace, and profound place in this world. Life Symphony, a tribute to Nature and its rhythms, is a stunning, three-minute compilation of three years of filming. This short video, shot in Australia, shows how simultaneously vulnerable and resilient our coral reefs are in the face of bleaching. We hope all divers are as helpful as this one who removed a huge hook from a lemon shark’s belly. Borneo From Below: Episode 27 – Small Blue World: Little People, Big Adventures! Top underwater photographer Jason Isley is used to shooting BIG animals. However, in his latest book, he’s doing something a LITTLE bit different. Come dive into Small Blue World, a quirky look at man’s complex relationship with the ocean.